Hi everyone. Today we will be showing you the recipe for our Soothing Salve. Salves are very versatile and is easy for you to make. All the ingredients are geared to maintain the natural oils in your skin instead of removing them, making this a very high quality product. This is a good product for you to sell or use for yourself. Firstly, there is the mango butter and olive oil. Mango butter has essential fatty acids while olive oil is antioxidant rich. Both are crucial in moisturizing and making the skin healthy. The next ingredient, basil sage mint oil has an anti-inflammatory effect, helps clear scars on the skin, as well as keeps the skin refreshed at all times. Salves are applied on dry or inflamed skin areas, therefore, zinc oxide is added into the salve. Zinc oxide has an anti-inflammatory effect, and keeps moisture locked to the skin. Finally we add beeswax which is a natural thickening agent, making it easy to apply on an affected area. 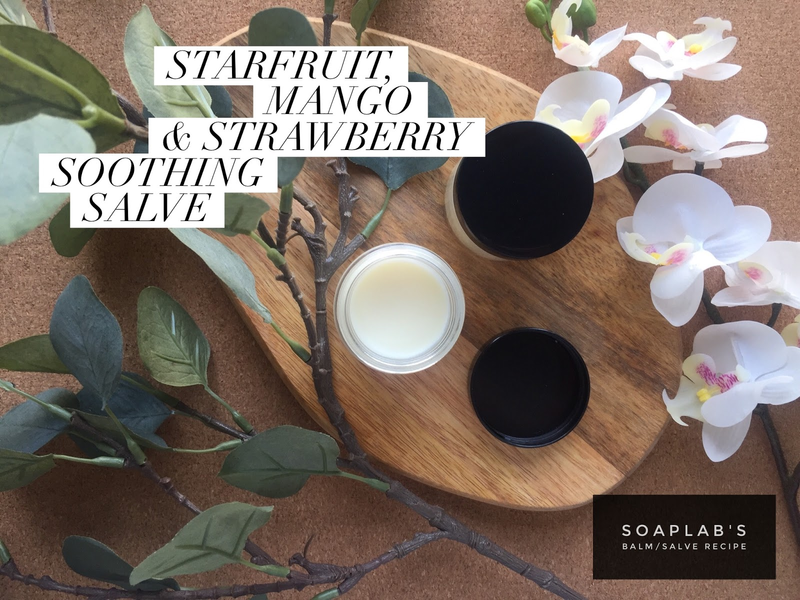 The salve has a fruity and refreshing tropical smell as it uses star fruit and mango fragrance oils.